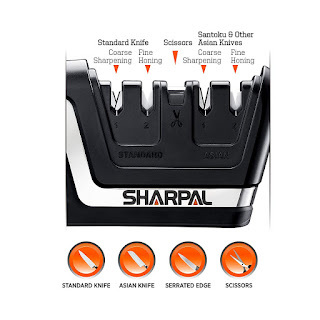 Sharpal 6-in-1 Knife Sharpener & Survival Tool has tungsten carbide blade for a quick edge setting. Ceramic blades for a fine honing tapered diamond rod with grooves for serrations, gut hooks & fish hooks. Integrated with fire starter; High-pitched emergency whistle. Preset optimal sharpening angle and a built-in lanyard hole. Has been 10000 times tested the knife blade was pulled through the two sharpening slots 10000 times each and no break found in both 1tungsten carbide and 2 ceramic blade. It measures 3-1/2 inches long and 1-2/5 inches wide, and it weighs only 1.5 ounces making it portable. Soft rubber coated design for comfortable grip. 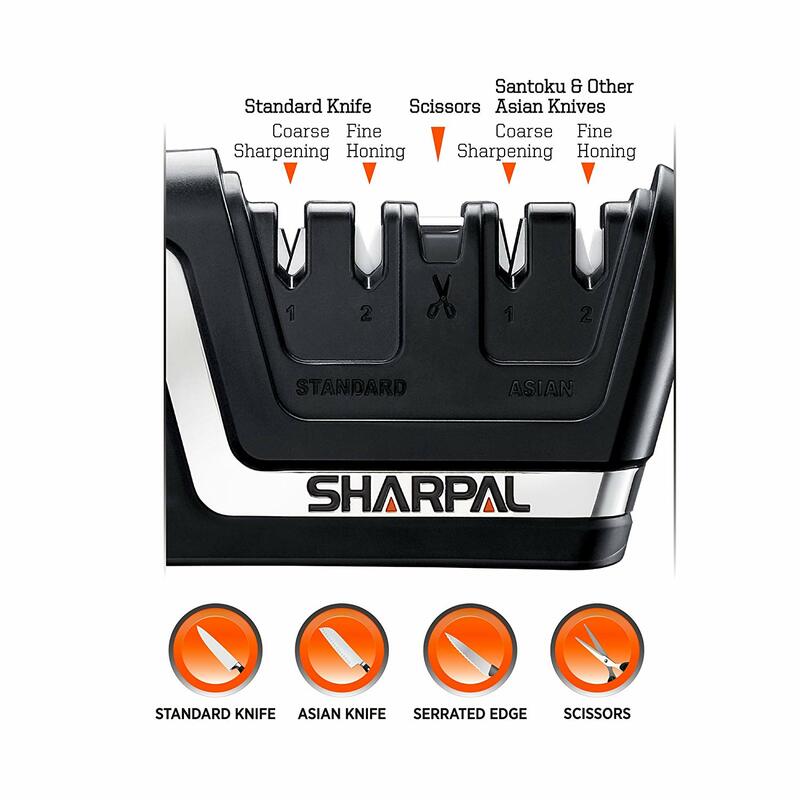 SHARPAL 104N Professional Knife & Scissors Sharpener is a perfect sharpener for those who own both standard European/American style knives and Santoku & other Asian style knives of the double beveled edge. Stage 1 uses two preset crossed carbide blades to put a quick edge on knives. Stage 2 uses ceramic blades to hone the fine edge. This sharpener can also be used for serrated blades. Only use stage 2 for serrations. The specially shaped tungsten carbide blade is designed for scissors sharpening. The heavy-duty, ergonomic handle with the rubber over-molded grip provides a stable and comfortable platform for sharpening all your knives, scissors. My Opinion: These are both great items as the 6-in-1 can be given as a gift to a prepper, hunter, fisherman and it is very versatile. The knife & scissor sharpener is small but large enough to handle any job and perfect for your kitchen, a chef and easy to use.